Grangetto's Farm and Garden Supply Services - » What is That White Stuff? Powdery mildew is a fungal disease that results in a powdery gray or white coating on the leaves and stems of infected plants. It starts out as a few spores on the leaves, and quickly spreads, eventually yellowing the leaves and causing premature leaf drop. This happens frequently on roses, grapes, and many other plants. 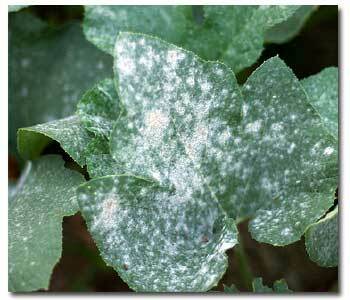 Powdery mildew thrives in temperatures between 60 and 80 degrees. Dry, shady conditions are ideal, as are areas with poor air circulation. Planting disease resistant cultivars and making sure you allow for good air flow are two ways to guard against powdery mildew. Good air circulation goes a long way. Trim plants that get crowded or bushy. 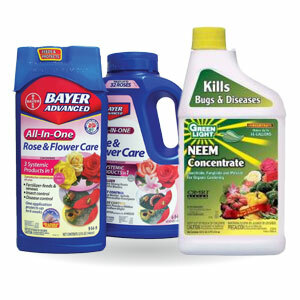 Inspect plants regularly during warm, dry conditions, and remove any leaves that show signs of infection. Destroy (do not compost!) infected plant parts. A spray made with baking soda, if applied weekly at the first signs of infection, can protect plants against further damage. Plants that are badly infected should be ripped out and destroyed to prevent the disease from spreading further. Avoid overhead watering and do your watering in the morning so any water that does get on leaves has a chance to dry. If your plants are getting spray from a lawn sprinkler system, try moving the sprinkler a bit further away.